In my recent work, I have been using the round plate form as a kind of lens, much like that of a telescope or microscope. The concave interior surface of a platter becomes an ideal canvas on which to explore. When firing in wood and vapor kilns, subtle changes in the shape of a piece can influence how flames move over the clay and, consequently, how it is colored and textured. I am excited by the possibilities of combining intentional marks with the serendipitous glaze effects from the fire. By manipulating the two-dimensional surfaces of a three-dimensional form, I hope to create an illusion of depth, be it celestial or cellular, that goes beyond the piece itself. I choose to use porcelain and stoneware clay bodies that are enhanced by high temperatures and varied atmospheres. Some of my clays are more difficult to throw and manipulate than typical commercially produced clay bodies due to additions of soda feldspars, such as Nepheline Syenite, or inclusions of coarse materials such as beach sand or rocks. These additions enhance the beauty of the fired clay. I particularly enjoy using naturally occurring clays that I dig from the ground. More often than not, these native clay bodies fire more beautifully than any clay manufactured by industry. At this point in my career, I enjoy exploring the expansive breadth of glazes available at temperatures of 2300F and higher. The chemistry involved in successfully formulating and testing glazes stimulates the scientific part of my personality. I am particularly interested in drawing inspiration from glazes used in Song Dynasty (960-1279) China (chun, celadon, and tenmoku in particular) and Momoyama period (1573-1615) Japan. (shino and oribe) Although I prefer, for the most part, to fire at high temperatures, I will occasionally fire pottery in the dramatic low fire technique of glazed raku. Almost all of my pottery is thrown on the wheel. I find the process of wedging and throwing clay to be physically exhilarating and spiritually meditative. Though I often reproduce my forms, I do not mass produce any particular object. Each piece is unique, often being altered from the symmetrical shape that came off of the wheel. My pots are inspired by Asian forms from China, Japan, Korea, Thailand, and Vietnam. I like my pots to posses the soft, luscious quality of wet clay even after it is fired to vitrification. Though elegance and refinement are often my goal, I also embrace asymmetry and imperfection. Firing wood kilns is my passion. There is no more challenging or fulfilling experience than creating and managing a 2400 degree (Fahrenheit) inferno over the course of six days with fellow potters who share the pyromania. Though the firing process itself is an art form, the surfaces that result from wood firing are some of the most interesting and beautiful available in the entirety of ceramics. The subtle blushes, intense flashes, natural ash glazes, and crystalline formations are comparable to the chaotic order found in nature. Although I presently fire with other potters in their kilns, I will ultimately build my own small, tatami-brick anagama similar to the kiln that I fired at Kent State University. The roof is made from handmade bricks that are cone-shaped and hang down like stalactites. During the firing, wood ash accumulates on the cones, which eventually turns into glass and drips down onto the pots, creating beautiful halos of glaze. Although I truly love the wood firing process, it is neither practical nor ecological to fire all of my glazed pottery with wood. Using propane as fuel, I have lengthened the traditional stoneware/porcelain cone 10 (2350F) firing schedule to 16 hours, and maintain a smoky reducing atmosphere from 1550F onward. Such a long firing is often tiresome, but the carbon-trapping effects and crystal growth that I seek are not possible with shorter firing cycles. All of my glazes must be functional, so I make sure that the clay body is fully vitrified and the glaze fits well. I use no toxic chemicals in my glazes. The process of growing crystals on the surface of pottery is quite complex. I start by applying a thick glaze that is saturated with zinc oxide and silica. Each piece is placed on a firing pedestal that has been precisely made to fit the base of the pot. 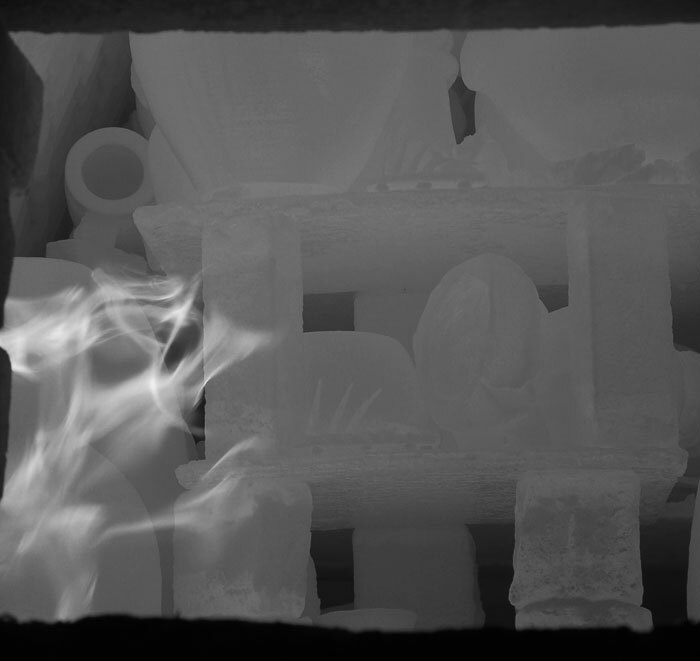 The work is fired to cone 10 (2350F) in a computer controlled electric kiln, at which point the glaze becomes molten glass. I program the kiln to hold the temperature at 2100F for 4-8 hours; this is the critical crystal growing phase. While the glaze is flowing down the surface of the pot, the zinc oxide crystallizes within the matrix of the glass. The excess glaze is collected in the firing pedestal. After the firing, the pots are carefully removed from their pedestals with a hammer and chisel. The pedestal is discarded and the base of the pot is ground on a lapidary stone. While this process is labor intensive, the beautiful crystals merit the effort.